2018 Moses Fluente 91 Easy Foil. Disclaimer : I am a retailer and sell Moses foils, so take it for what it is. The Moses Fluente 91 Easy, is a freeride and surf foil for general freeride and wave riding. Having said that, I would probably run a 71cm mast for purely surfing. All Moses wings fit on the same fuselage so you can chop and change masts, stabilizers or front wings at will to suit your needs. I have the 91, 101 and 111cm masts and will have the 71 by the time I get back to work in two weeks. 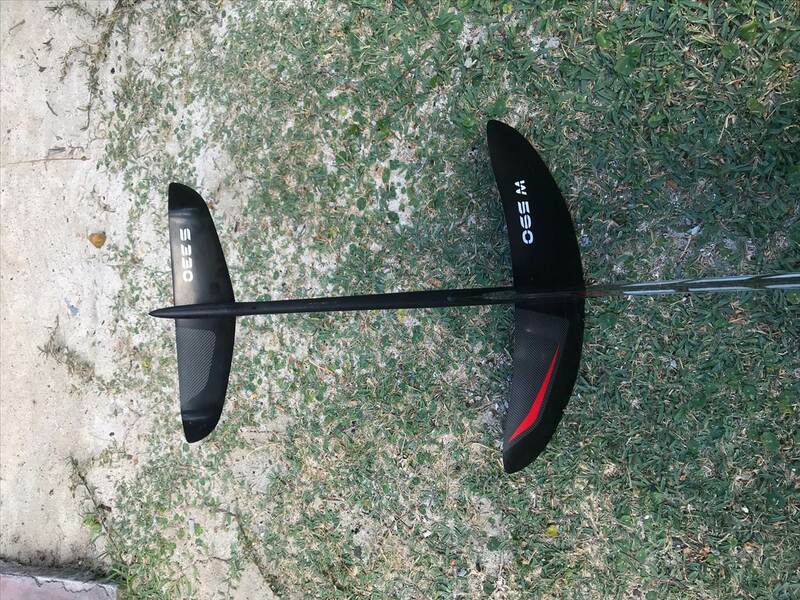 Construction is carbon mast, 590 carbon wing and 330 carbon stabilizer wingset, with Aluminium fuselage. 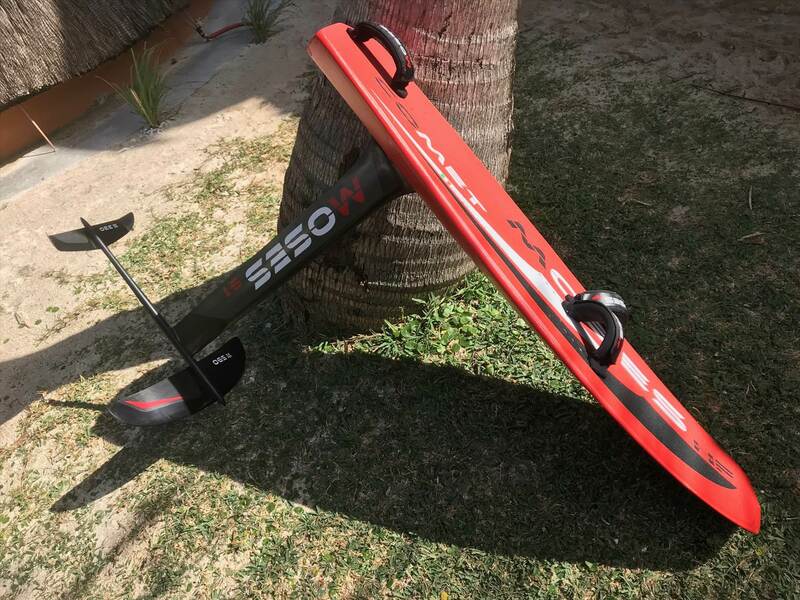 I bought the Fluente to bring to Mauritius with me as I heard the spot I would be riding, Pointe D,Esny, was shallow in low tides and I didn't want to damage my Comet 637 wing on the bottom of the 111 cm mast. I basically wanted the 91cm mast more than the wing but it came as a set and I figured learning tacks and gybes may be easier on the Easy 590 wing in any case. After riding the Fluente Easy 91 for most of the day today and yesterday, I can say that it has surprised me at how versatile this wing really is. Conditions were a fairly steady 15-20 knots and I used the 8.5 sqm North Ace in the morning and the 11.5 sqm North Ace in the afternoon.The Easy is, as it says, easy onto the plane with a short pump up out of the water, once there, it is happy to plod along at a slow pace until I got enough speed to level out and get down to business. As the wing is fairly big (compared to what I am used to) I expected it would be good up to around 20 knots and then become too much of a handful, which is why I took the 8.5sqm Ace initially, to try and keep power and speed to a minimum. 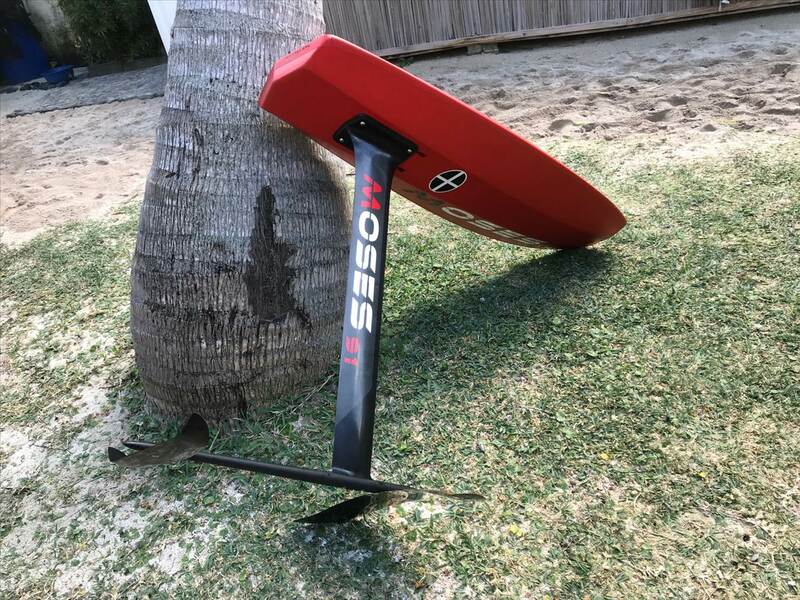 The 91cm mast is solid and the foil felt so stable and easy at 15-20 knots that I just enjoyed the ride and started doing some nice big carves from wing to wing on one tack and then put the pedal down on the return tack just to get acquainted with the foil. I was also unfamiliar with the Comet Race board as I have found the North Pro Foil to be more tolerant of mistakes, so I haven't spent much time on the comet board at all but it was nearly 2 kilo's lighter for packing so the North Pro got left behind. The stability at speed was quite amazing. A little additional front foot pressure saw the wing happy to stay in the water as we reached around 25 knots. There is very little drag with the Moses foils so it slips through the water and will just keep accelerating if you don't ease up with the Ram Air kite. I never actually managed to make the foil breach through excess speed but I reckon I came close. Unlike other foils I have ridden that have a definite max speed and once surpassed ends in a ball of spray and sore ribs once they breach. The afternoon session was with the bigger kite in similar wind speeds. I was far more mindful of the speed and power and so tried to "feather" the kite to keep power and speed to a minimum. When slowing the foil, it was amazing to see just how high an angle of attack the main wing would withstand without stalling. If you have never seen a Moses foil in the flesh, it is worth making the effort to do so. The craftsmanship of the carbon in the wings and super stiff and precision joint is very impressive. The Fluente 91 Easy is the perfect foil for the average rider looking to do a bit of everything. Super easy to ride, extremely stable, with amazing low speed ability, easy to carve nice turns and yet, has a very surprising and stable top speed. I would think that with an inflatable kite, it would be a dream being able to regulate power more readily. When cranking upwind at near max speed, the heel angle allowed the upper wingtip to break the surface several times, but no stress, it behaved well with no ventilation or tip stall. With a foil that has so little drag, coupled with a ram air kite that keeps producing power even when de-powered it really allows the foil to build speed very quickly. I became very accustomed to the foil quite quickly and managed to complete my first 5 roll tacks "on the wing" in the second session with the Comet board and my foil kites. This is a very impressive foil, like all of the Moses wings I have flown. In a world full of average foils that "get the job done", it's nice to find a foil that performs as good as it looks and for not drastically more than alloy. I'd add that the chimes or whatever they're called on the side of the board do their intended job really well of helping you to bounce back up on the foil and not crash / nose dive when you dip. Plus it's quite robust. I've hit sandbars twice now and although i bent the screws once and had to replace them there was no damage to the board or wing. I haven't been able to get mine over 25 knots on my gps recorder. Not sure if that's the foil's top end or me chickening out and subconsciously pulling back...? I started on a learner friendly aluminium foil and upgraded to this after a year. I reckon you could just as easily learn on this one too as long as you foil at a deep water spot with no risk of bashing into sandbars (this wasnt the case at my local spot). Absolutely, the foils are tough but don't like reef. It's high quality carbon and needs to be looked after. 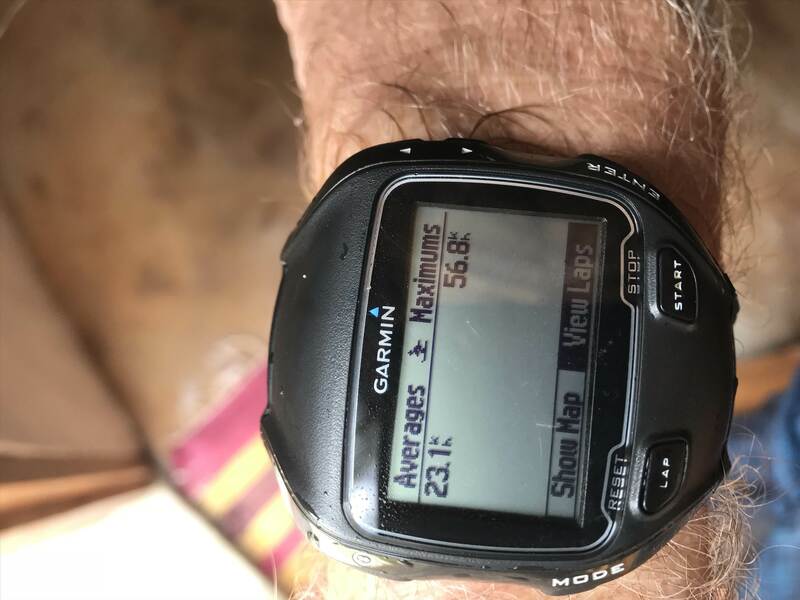 So if you live at a place with shallow waters, sandbars, reef or rocks, make this your second foil and learn on something that is relatively reef proof. The Comet board I have is a custom I think. It's quite fragile but extraordinarily lightweight. I was super keen to jump straight onto the Comet board and foil combo but I found the Comet board difficult to learn on especially during water starts and getting up onto the wing. It's narrow in the tail, quite deep bevels to the chines and this tends to lock the board on a trajectory when it's in the water. I adopted the Comet foil and North Foil Pro board as it has much softer bevels, soft chines and wider outline. This makes it much more user friendly. I really loved the North Foil Pro and decided that if I only take the Comet board, I'd be forced to adapt quickly, and this is exactly what has happened. I can now fully appreciate the Moses Comet Board. The Chines do a great job of keeping the board up from the water with accidental touchdowns at speed. When cranking upwind hard on the North board on the race foil, any contact with water when above 25 knots resulted in a wipeout. At lower speeds or when not heeling over so much, it was never a problem. As I've improved and gotten faster and more aggressive with my race foil, the chines are playing more of a role. The Comet board is amazing in the same scenario, there is almost no change of speed or direction with accidental touchdowns when heeled over hard. I would review it, but as it's a custom, I don't think there's much point. The T60 looks like a damn nice baord though and I'd be keen to try that. Thanks for your comment. From today's Fluente Session 56.8kph or 30.66 knots. To be fair there was a current on that tack but I managed a 27 knot run on the tack into the current so average around 28.5 knots and it would have gone faster. It felt good but I was wortied about a crash with only the front foot in the strap. Very fast foil! Bravo Moses! Mate thats great speed out of that foil, you have skills. Nice review and exactly what I am hearing from everyone else an these foils. Dunno about skills, its an easy wing to ride. 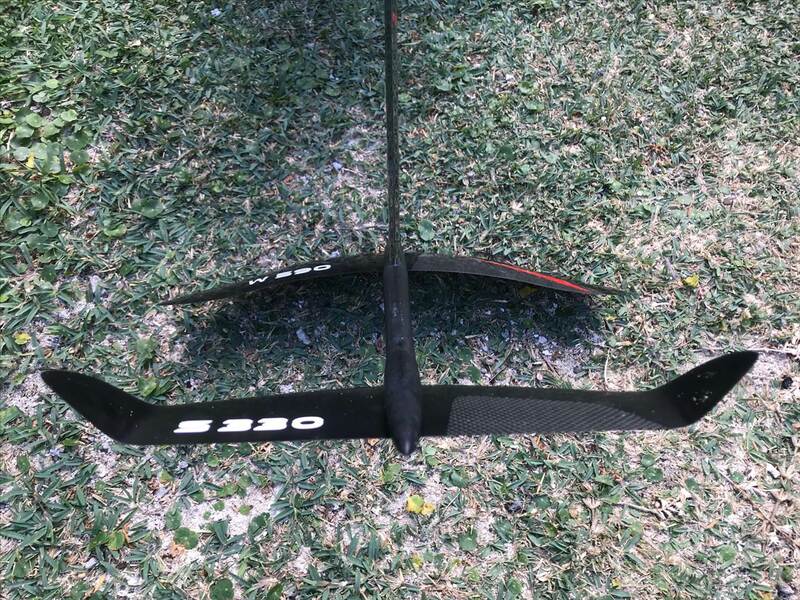 I can now add a durability review to the 590 carbon wing. I hit the reef yesterday in light winds on the 14.5 Ace at low tide. Hit it fair and square at around 10-13 knots speed. Apart from a bunch of decent scratches along the bottom of the wing and some decent nicks in the leading edge, most of it sanded and polished out, more than enough to get back into it and ride as per normal. Ideally I'll need to repaint the wing with a filler coat and re-sand it to get it back to new, but it's 98%. Pretty impressed with it, considering the hit wasn't soft at all.